In January 2003 a salvage excavation was conducted in the Ashqelon Metal Company compound located within the Migdal neighborhood (Permit No. A-3804; map ref. NIG 161299/620400; OIG 111299/120400) after ancient remains were discovered in probe trenches. The excavation, on behalf of the Antiquities Authority and with the financial support of the Afridar Company, was directed by Y. Haimi, with the participation of H. Lavi (administration), A. Hajian (surveying and drafting), I. Lidski-Reznikov (artifact drawings), M. Salzberger (studio photography) and D.T. Ariel (numismatics). Parts of buildings representing two architectural phases were exposed at the site. Three walls of a room (W101, W102, W103; L10; Fig. 1) were exposed that were built of wadi cobbles and treated on their outside faces with hydraulic plaster. West of the room was another wall (W108, L31) on whose southwestern side was an installation. 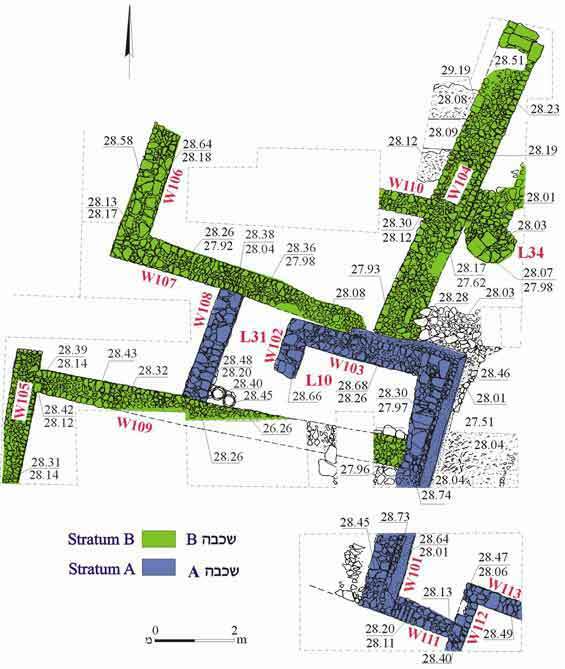 Southeast of W101 were sections of walls (W111–113) of another room, most of which was not excavated. While exposing Walls 103 and 108, four coins were found, of which three fulus were identified, one of the Umayyad governor Marwān b. Bashīr (c. 705–710 CE; IAA 97967) and two from the Abbasid period (one dated to 832 CE; IAA 97966, 97970). The pottery from this layer included bowls (Fig. 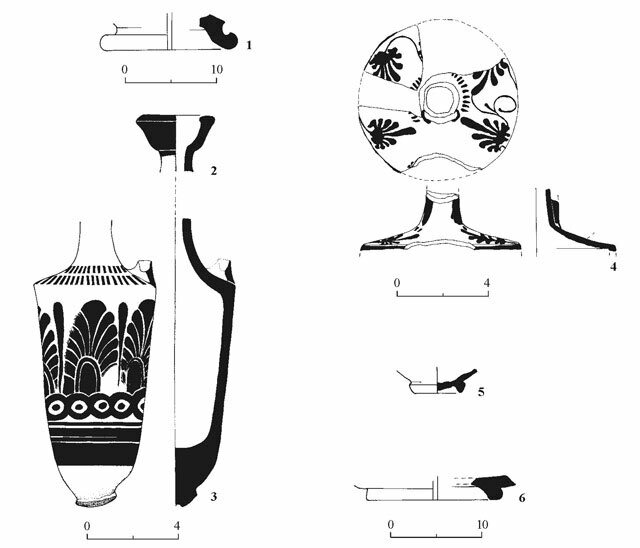 2:1, 2), kraters (Fig. 2:3, 4), a casserole (Fig. 2:5) and storage jars (Fig. 2:6, 7) that are characteristic of the end of the Byzantine period and the beginning of the Umayyad period, and a lamp (Fig. 2:8) from the Abbasid period. Below the remains of the upper building were walls of two rooms that belong to an earlier structure. In the north Walls 104, 107 and 106 form a room whose northern wall was not found and whose interior is divided by a partition wall (W110). East of Wall 104 is a round column base that was incorporated into the floor bedding (L34). Pottery vessels were found on the floor, among them a Late Roman Ware bowl (Fig. 3:1), Gaza storage jars (Fig. 3:2, 3), a juglet (Fig. 3:4) and an intact sandal lamp (Fig. 3:5) that date to the sixth century CE. Southwest of this room the northern and western walls (W105, W109) of another room were found. Wall 101, ascribed to Stratum A, was partly destroyed by a recently cut refuse pit that was excavated to a depth of 3 m. Fragments of pottery vessels found in the pit include the base of a mortarium (Fig. 4:1) and lekythoi (Fig. 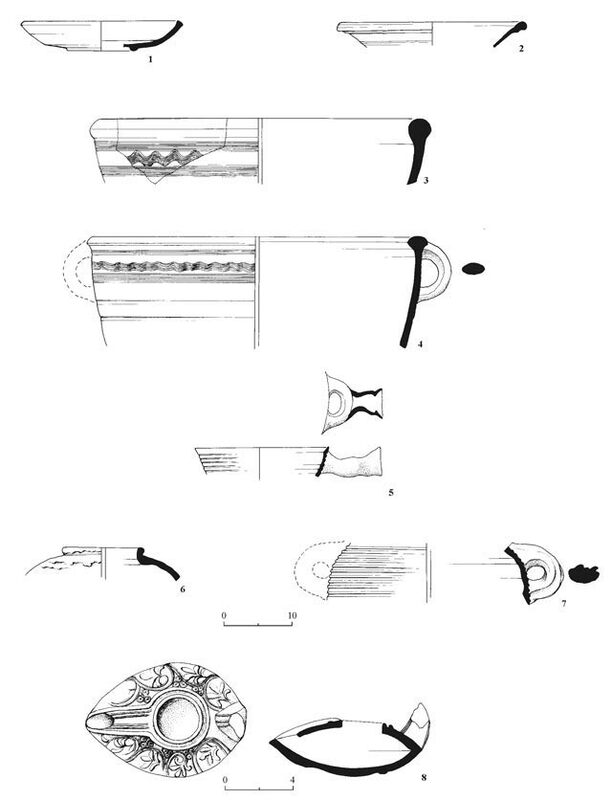 4:2–4) from the Persian period (fourth century BCE) and fragments of bases of Terra Sigilatta bowls from the first century CE (Fig. 4:5, 6) together with sherds that date to the sixth century CE originating in Stratum B. Due to the imposed limitations of the excavation it was not possible to enlarge it in order to determine the original context of the ancient pottery vessels that were found in the refuse pit and ascertain the period when it was dug. Eleven coins from the Byzantine period were discovered, of which ten were identified; some date to the second half of the fourth century CE (IAA 97961, 97965, 97972, 97973) while others date to the sixth century CE, almost all of them small denominations, including five pentanummia (IAA 97960, 97963, 97964, 97969, 97971). The latest coin is a hexanummium (IAA 97962) from the reign of Heraclius I, struck at Alexandria (613–618 CE). The remains of two settlement strata were exposed in the excavation that apparently was established at the end of the Byzantine period (Stratum B; sixth century CE). It seems that it was rebuilt at the beginning of the Umayyad period (Stratum A; seventh century CE), apparently extending into the Abbasid period. 1. Strata A and B, plan. 4. Pottery from the refuse pit.